http://americanchalet.com Presents this afordable at $29.99 and up docking station. The HomeDock makes your iPod the centerpiece of your home entertainment center. HomeDock includes everything you need to connect and play your iPods pictures and videos on your home stereo and TV as well as synchronizing to your Mac or PC Via USB. Enjoy room filling sound and big screen video straight from your iPod. Control everything from across the room with the HomeDock 14-function remote, all while charging your iPod with the included AC adapter . Make your iPod feel right at home with this HomeDocker for Apple iPods. 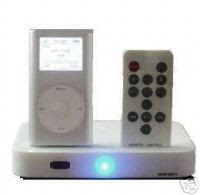 Play your iPod or Ipod Nano’s Music through your home stereo and hear how good your iPod really sounds. Watch videos from your iPod on your big screen TV. HomeDock includes everything necessary to connect and play your music, photo’s and video’son your home stereo and television. Control over 14 separate functions including photo slide shows with the HomeDock’s Remote Control. Use the HomeDock to charge, sync and play your iPod at your computer using any standard USB cable. Combine your iPod, HomeDock and a pair of powered speakers for a complete compact sound system. 14 Function Remote- controls, music, video and slideshows. 6 Foot AV Cable- connects to stereo and TV right out of the box. AC Power Supply- powers and charges iPod when docked. After setting up and using this unit I found the ease of use and set up surprising. After a slight learning curve I was useing all the functions. Great product A+. I recomend everyone check out http://americanchalet.com's auctions.